Soft Pastels are pure pigment which create velvety, vibrant color. They can be applied lightly, or in several layers for a painterly look. They are easy to pick up and work with at any time, as there is no mixing of paint, or drying on the palette. We’ll explore their versatility as we experiment with a variety of supports in an array of colors from lightly textured paper to sanded paper. All levels are welcome. A gifted instructor, she relishes passing on that passion to her students which have included high school and adults. Past instruction has included The Timothy Ministry of First Baptist Church and Masters Academy of Fine Art Portfolio program, Woodstock, Ga. 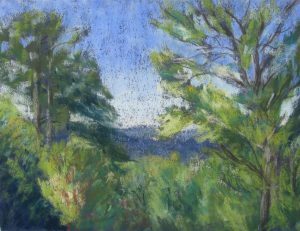 Currently she teaches landscape oil painting courses at the Eastern Shore Art Center in Fairhope, Ala, and is available for private instruction. To see more of the artist’s work, visit her website at www.painterlygirl.com.